It’s not a secret English has one of the craziest spelling systems in all European languages. Really, why are words never read like we expect them to be? 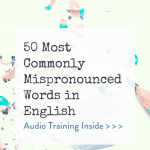 In this article, you will learn about the most commonly mispronounced words in English and how to improve your pronunciation and listening skills. What are commonly mispronounced words in English? Make sure you pronounce all these words right. Practise with the audio. This could be confusing, but they are absolutely learnable. I recommend working with these rules step by step.